As some of you already know, we’ve got several engaged ladies (and one recently married!) here at World Digital Imaging. Jessica and I are both less than a year out from our weddings, and so we’re knee-deep in the middle of planning. 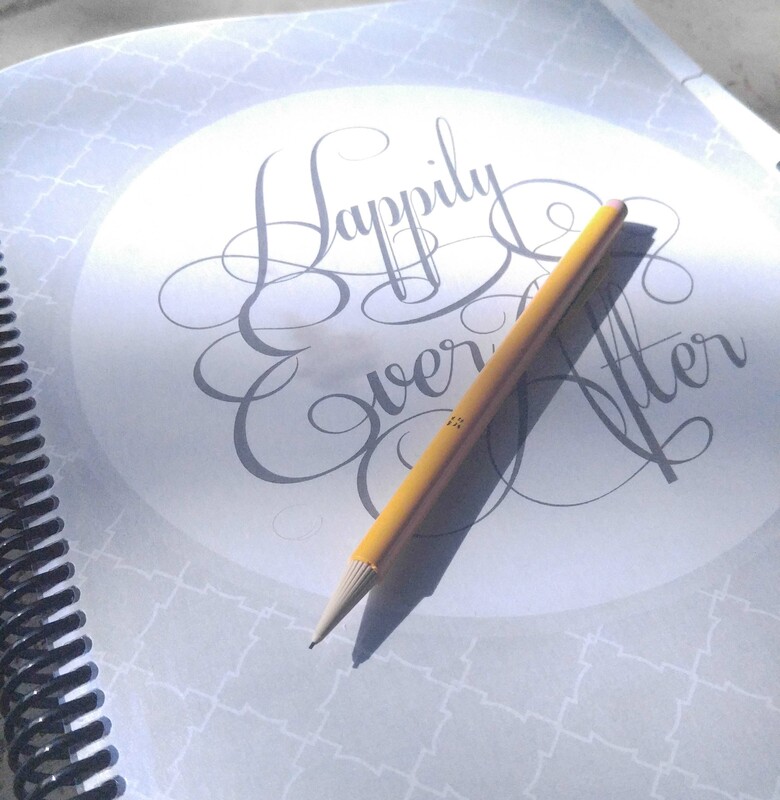 As we were discussing some of our plans recently, we both expressed the need to have some sort of planner in order to keep everything straight. After all, not only do we have all of our own “normal life” stuff to keep track of but we also have wedding tasks to coordinate. It can all get pretty crazy very quickly! Step 1: Decide how you’re going to bind it. Most people keep their planner together in a binder, however I found for myself that one of our coil books was easier to keep everything together and carry around. If you choose to do a bound book like mine, I would advise getting a few folders that you can bind into the book. Since you can’t easily add pages like a binder, the folders will help keep together some of the loose sheets. Step 3: Get your dividers. This will be where I keep my checklist of things I have to do each month before the wedding. These are my monthly and weekly calendar pages, to keep track of appointments and such as we go. Maybe the most important tab, this one is where I’ll keep my budget planning worksheets and receipts. I also plan to keep track of deposits and bills that are paid here. Important people’s numbers, such as my vendors and my bridal party. It’s important to keep all of this information together in one place, so that it is readily accessible in case you need to get in contact with someone. Information for all of the various invitations, as well as any additional stationery such as programs, thank yous, etc. Ideas and information for my photographer and videographer. Everything from the bridesmaids’ dresses to the groom’s tux, and everything in between. This is also a great section to keep track of your trial-runs of hair and makeup, as well as other beauty appointments for you and your ladies! Another very important category, this is where we’ll keep ideas for what we’ll feed everyone for the reception. Our first dance song, any do-not-play lists, and the DJ or band’s information. My dad was a DJ for years when I was a kid, and my fiance is musically inclined, so for us this is an important category to keep everything organized for our DJ. Keep track of all of your registries here! Several of the printables above include great checklists for keeping track of what items you need to have on your registry. Any miscellaneous information that doesn’t fit into one of the other above categories. Keeping notes is always a good idea! I included several lined sheets of paper in this section to jot down ideas for later. This section will house all of the information regarding the various other celebrations that go along with the wedding, such as the engagement party, bridal shower, and bachelor/bachelorette parties. I wanted a section to encompass all of the additional day-of information, such as timelines for the bridal party and parents. Obviously, this one deals with all of the ceremony stuff. This is where I am keeping the drafts of the ceremony, our vows, order of events, etc. Just like the Ceremony section, only for the events happening at the reception (Special Dances, dinner and dancing times, and so on). You can’t forget about the honeymoon! Here, I’m keeping all of our ideas for where we want to go, as well as travel information for when we book the trip! So as you can see, I tried to cover every aspect of a wedding from start to finish. 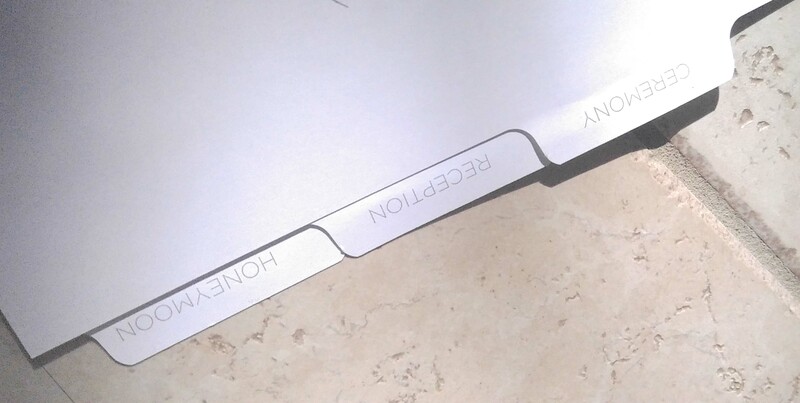 And we’ve made the dividers available to you as well! Download the full set here! Finally, gather each of your printable sheets into the section where you feel it best fits and then bind it all together in the method of your choosing. And that’s it! Do you have a favorite printable page that we didn’t include? Or have a suggestion for something we missed? Let us know in the comments!